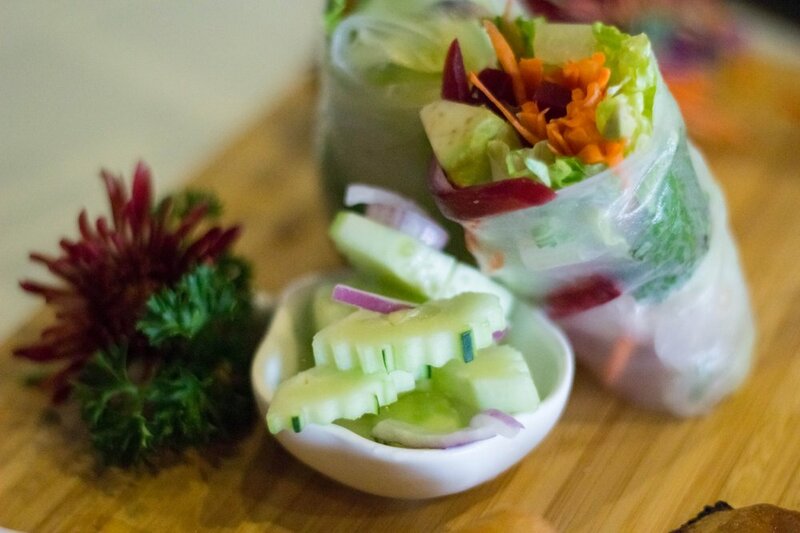 Both traditional and inventive bites are on the menu at the new Spring Thai in Cotati. 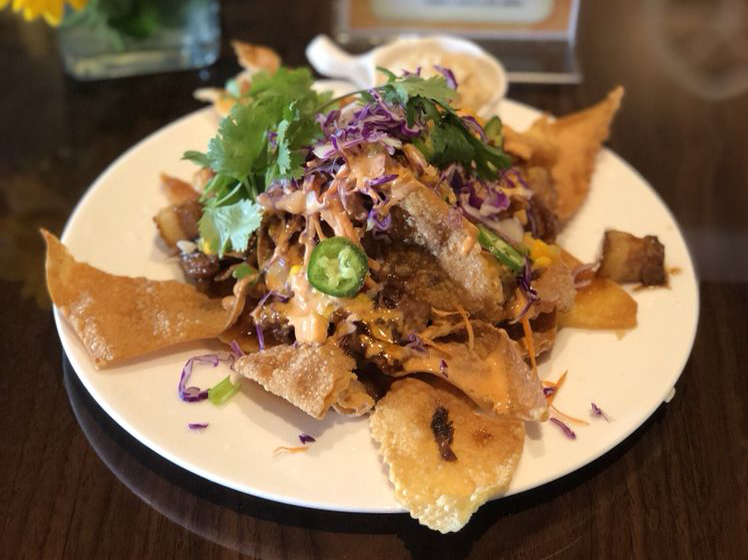 Thai nachos are addictive — and yes, there is such a thing, when you dine at the new Spring Thai in Cotati. The random special brings crispy fried wonton chips mounded in shredded pork, jalapenos, shredded cabbage, and cilantro, with homemade peanut sauce for dipping ($9.99). The restaurant’s chef-owner, who goes by Mary S., also crafts whimsical bites like Thai bruschetta, layering grilled prawns, avocado, peanut sauce, and Asian pesto on thin-sliced, toasted bread ($9.99). It’s easy to eat a lot of these, too. To be sure, there are more traditional dishes here as well, such as a lovely Tom Yum soup, the clear, sour broth intense with lemongrass and stocked with mushrooms, cherry tomatoes, shallots, chiles, cilantro, and a choice of tofu, chicken, pork, or beef ($5.99 small /$9.99 large). But really, this is a good place to branch out and try something different — fried spinach salad, anyone? The look: The place, in a strip mall anchored by the local Oliver’s supermarket, is spare but cozy, with beige walls, beige wood floor, and white cloth tables topped in glass. A few art pieces and a fish tank add extra color to the quiet vibe. To eat: Our group began with the Starter Parade ($15.99), which brings two each of lots of good stuff. We munched through golden fried spring rolls stuffed with taro root, glass noodles, carrots, and cabbage; herb marinated chicken satay; rice paper signature rolls plump with romaine, steamed beets, carrots, and avocado; bruschetta; and delicious fortune bags of parsley-wrapped wontons filled with real crab and seasoned cream cheese perched on a cucumber slice moistened in vinaigrette. Homemade pot stickers are a tasty bargain, too, delivering five sautéed nubbins stuffed with ground pork, cabbage, carrots, and corn finished in soy glaze ($6.99). Crisp on the edges and moist inside, the little bundles are just what pot stickers should be. The four of us also scooped up Floating Market soup, filling up on the Tom Yum stocked with fish, scallops, prawns, calamari, salmon, mussels, and basil ($13.99). It’s a lot of food, and well prepared at a reasonable price. I love green papaya on a hot day, and this version hits the spot, the tart shredded fruit tossed with tomato, green beans, and crunchy roasted peanuts in a spicy garlic-chile-lemon vinaigrette ($7.99). That fried spinach salad is refreshing, too, if a bit boring, in a crispy kale idea topped in cashews, red onions, and vinaigrette ($7.99). 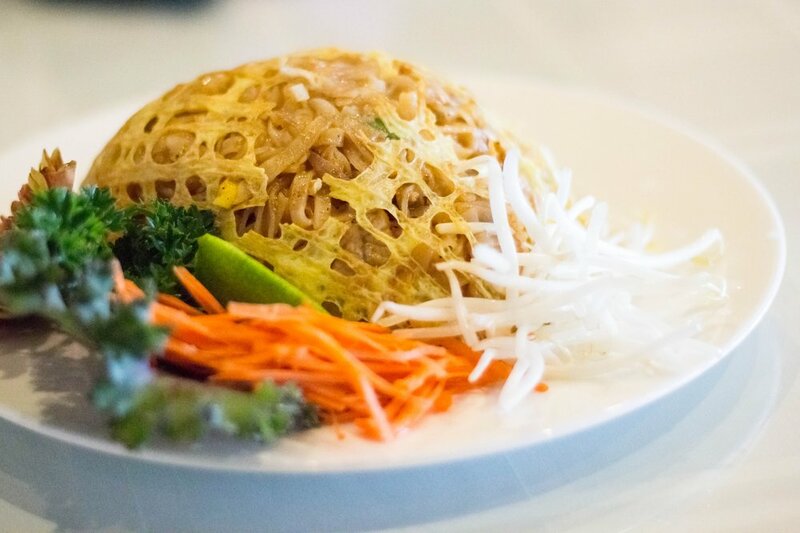 Spring Thai is known for its pad Thai, partly for its inventive presentation. The pan fried thin rice noodles, green onion, and choice of meat are shaped into a dome capped in thin crackly egg and crushed peanuts, then flanked by julienne carrot, bean sprouts and cilantro ($8.99 lunch/$10.99 dinner). I spritz it with lime, and it’s one of the best pad Thais I’ve had since it’s not too sweet. 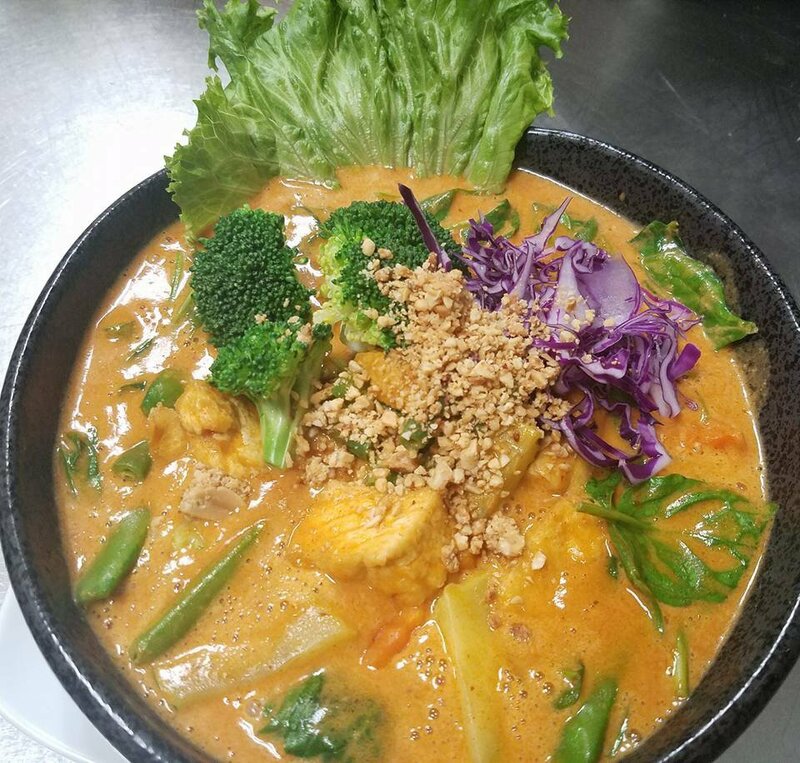 Come here, as well, for the standout peanut curry of steamed rice noodles and meat atop steamed broccoli, and spinach ($8.99/$10.99) or the green coconut milk curry ladled over avocado, salmon, and carrots with a touch of basil. The avocado sounds like a weird addition, but it’s creamy and rich and cuddles with the salmon. To note: You can get the Thai favorite of coconut milk served in the shell ($3.99). Dessert: My new favorite finish is Thai tapioca pudding ($5.99). The coconut milk lends a gentle sweetness. To drink: Thai iced tea or coffee ($2.99) are always nice, or you can ramp things up with a selection of beers and sakes. Details: Spring Thai, 538 E. Cotati Ave., Cotati, 707-665-5180.